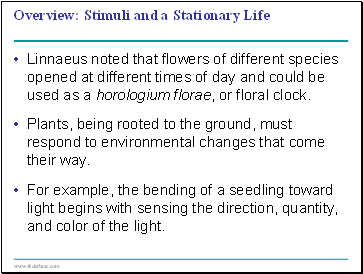 Linnaeus noted that flowers of different species opened at different times of day and could be used as a horologium florae, or floral clock. Plants, being rooted to the ground, must respond to environmental changes that come their way. For example, the bending of a seedling toward light begins with sensing the direction, quantity, and color of the light. 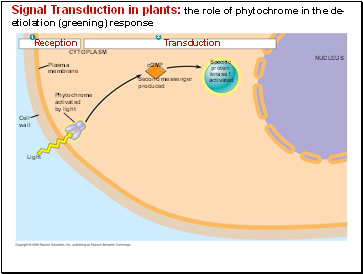 Plants have cellular receptors that detect changes in their environment. 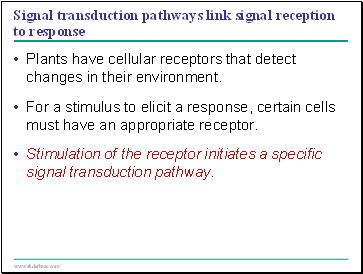 For a stimulus to elicit a response, certain cells must have an appropriate receptor. 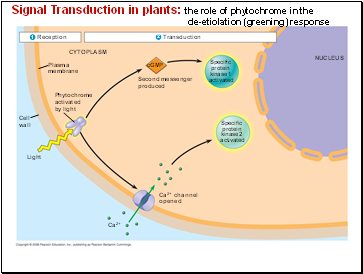 Stimulation of the receptor initiates a specific signal transduction pathway. A potato left growing in darkness produces shoots that look unhealthy and lacks elongated roots.These are morphological adaptations for growing in darkness, collectively called etiolation. 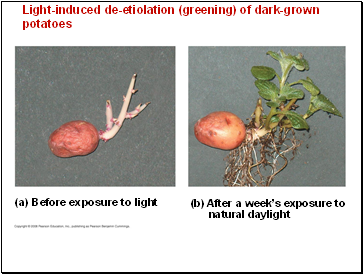 After exposure to light, a potato undergoes changes called de-etiolation, in which shoots and roots grow normally. 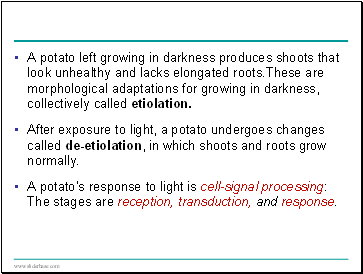 A potato’s response to light is cell-signal processing: The stages are reception, transduction, and response. 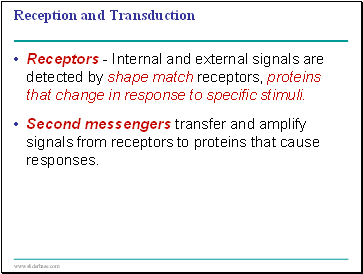 Receptors - Internal and external signals are detected by shape match receptors, proteins that change in response to specific stimuli. 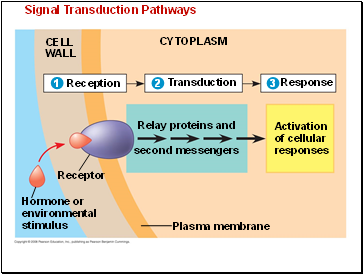 Second messengers transfer and amplify signals from receptors to proteins that cause responses.